Akron Beacon Journal critic George Thomas, left, and Chris Hewitt, critic at the St. Paul Pioneer Press, may not always see eye-to-eye on movies, but sthey agree that Double Feature, an online podcast of their reviews, is a hit with readers. Call it the high-tech version of Siskel & Ebert. Akron Beacon Journal movie critic George Thomas and Chris Hewitt, his counterpart at the St. Paul Pioneer Press, have teamed up for Double Feature – a podcast in which they discuss current releases. Thomas credits Jim Arnold, producer at Ohio.com, for the idea. During the Oscars, the podcast expanded to include a roundtable discussion of the nominees by seven Knight Ridder critics. By mid-February, the Oscars podcasts had been downloaded 1,000 times. Movie review podcasts downloads for the month of March were 5,888. 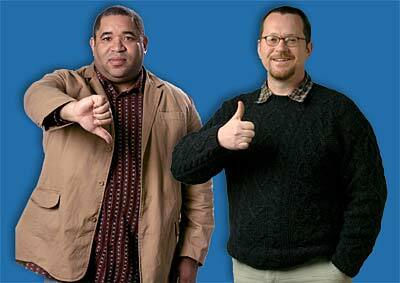 The duo skips any variation on the famed “thumbs up/thumbs down,” however. “We didn’t want to go for complete theft,” Thomas joked.